. . . having a working command of the creative process–that is, all those elements that lead to the making of art–is truly essential. The creative process unfolds as you find the essential tools in your toolkit. It means finding your subjects (not someone else’s) and finding your materials (not someone else’s) and most of all it means finding a way to live your life so that you can engage again and again the things you care about the most. As Sunday fades into the late afternoon, I realize that I will soon have to lay aside my art work and take up Shakespeare for tomorrow morning’s summer school class. Teaching pays the bills; I do that so I can live to make art. Teaching supports my habit, though I must immediately add that this is the only profession in my career that has truly fit me. I have never stopped loving the educational enterprise. Perhaps that is because I am still a student, and always will be. I have made two trips to the Fort Worth Stockyards in the past four days, both times in triple-digit temperatures, and both times returning to my studio with a renewed interest in pursuing a series of studies in the edifices on North Main, especially the New Isis theater. As I continue to work on this watercolor, as well as additional compositions of this historic theater, I will have much to report concerning its history. I have been fascinated to find pages and pages of data on this remarkable structure and the stories it embodies. I have not put much work into this piece yet, save for the sign, the part that holds the most fascination for me. I’m about ready to move down into the awning and left to the pair of doors ready for rendering. The sign was a great source of joy, and I guess I can say that the most “fun” part of the painting is now behind me; everything else should just be supporting detail. Having said that, I may be closer to the end of this sketch than I realized when I began this blog post. But so it goes. I will write on the door of my studio: School of drawing, and I will make painters. Drawing is the priority of art. Copy, copy simply, wholeheartedly, abjectly that which you have before your eyes; art is never so perfect as when it resembles nature so closely that it might be mistaken for nature herself. Poussin often said that it is in observing objects that a painter becomes skillful. The three-day weekend from summer school has been so therapeutic for me. So many ideas have been flowing through my consciousness that I hardly know where to begin. Drawing has been on my mind ever since I bought the new sketchbook and the Fluid watercolor block prior to the pair of workshops I conducted recently. Though I am cranking out watercolor sketches daily, I am spending more and more time drawing, studying tonal values, textures and line qualities. I took a quick trip to Archer City, long overdue, to see what was left of Larry McMurtry’s used book store for hopeless bibliophiles–Booked Up Inc. The inventory has been reduced to a couple of hundred thousand volumes, mostly in one building now, instead of four, but there are no plans to close the store. They just launched a new website. I limited my purchase to two books, but absolutely love what I have been reading from Elizabeteh Gilmore Holt’s From the Classicists to the Impressionists: Art and Architecture in the 19th Century. The quotes posted above from Ingres gave me great impetus to do some sketching and plein air watercoloring in Archer City, even though temperatures climbed to 105. I photographed several structures that I plan to paint very soon–the Royal Theater (site of the film The Last Picture Show), two defunct gas stations, and several aged doors. 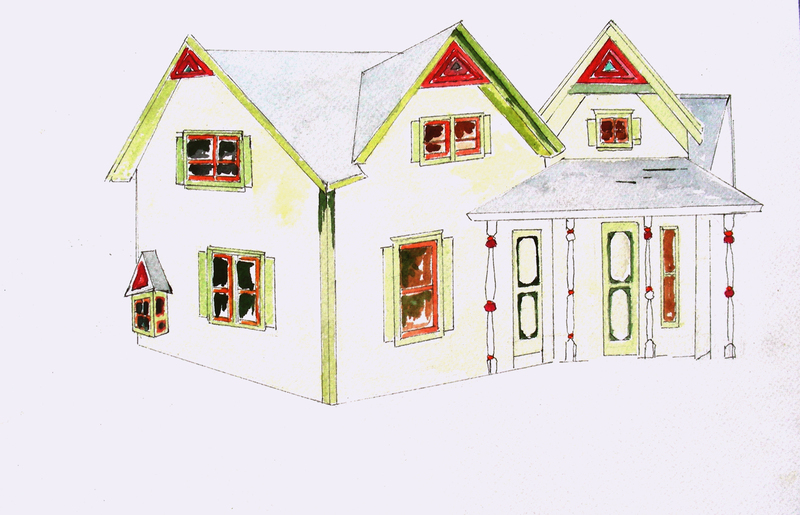 The sketch of the door above I began on site. I found it between a real estate office still in business and an antique store no longer in business. This particular door perhaps leads to a loft or attic above, and as I looked upon it, I was sorry to see the padlock, to me an indicator that whatever was behind the door was no longer in use. I fantasized about having a studio there, or an apartment, or a study with all my books. I didn’t know if the door opened to a flight of stairs or into a chamber. And I suppose I’ll never know. But the awning kept the sun off me, and I began a careful pencil sketch of it, then laid in some washes, followed by some drybrush texturing, and finally some more pencil detailing and rendering. Finally it got too hot for me to continue. I had drunk an entire bottle of water, then a jumbo-sized iced tea from the Barbecue place a few doors down from this site. 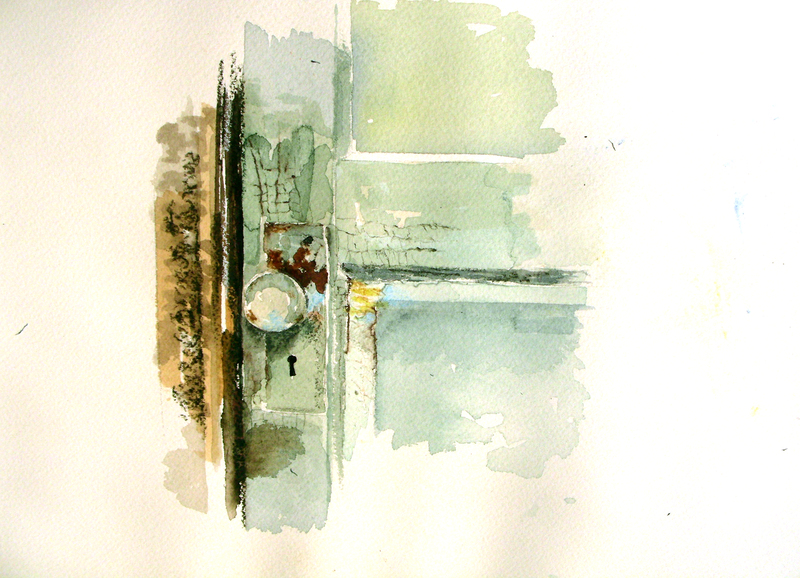 Once back home, I looked at several close-up photos I took of the door, and used them as models to finish this out. 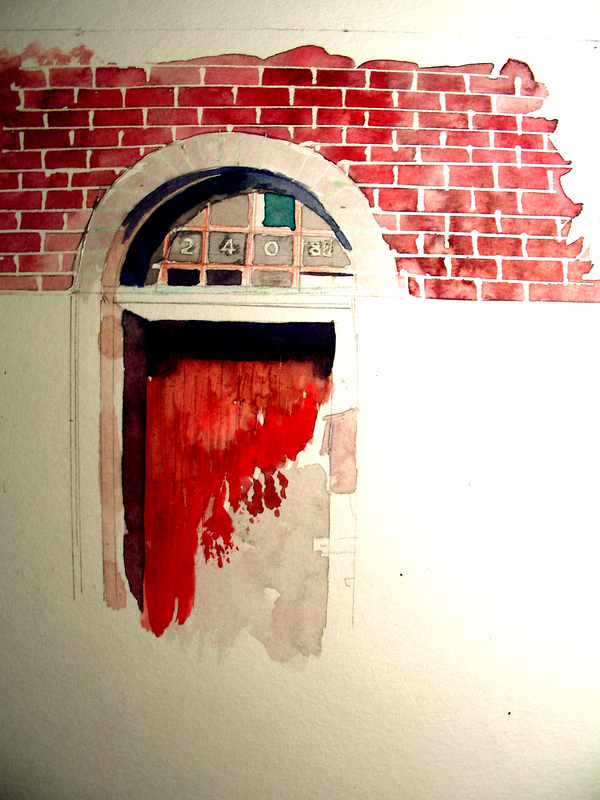 I think I am nearly done–I may perhaps indicate the recessed panel in the upper right portion of the door. This will be a 10 x 8″ composition inside a 14 x 11″ mat and plastic sleeve. I’m going to offer it at $100 for anyone interested. I’ve gotten attached to it already, though I only spent a little more than an hour total on the entire piece, maybe two hours. Five times a second or so, in common moments, we freeze-frame the most plausible reality we can from what’s available. Five times a second an electrical wave washes across our brain and we paint the foreground, mute the background, and thereby see, hear, taste, smell, feel the breeze on our skin. Several times per heartbeat, over and over from birth to death, we each separate the specific from the general, the figure from the ground, and decide which shape is the mushroom (or the field mouse or the lost contact lens) and which is not. We fit together the pieces that we can, and set aside the rest. 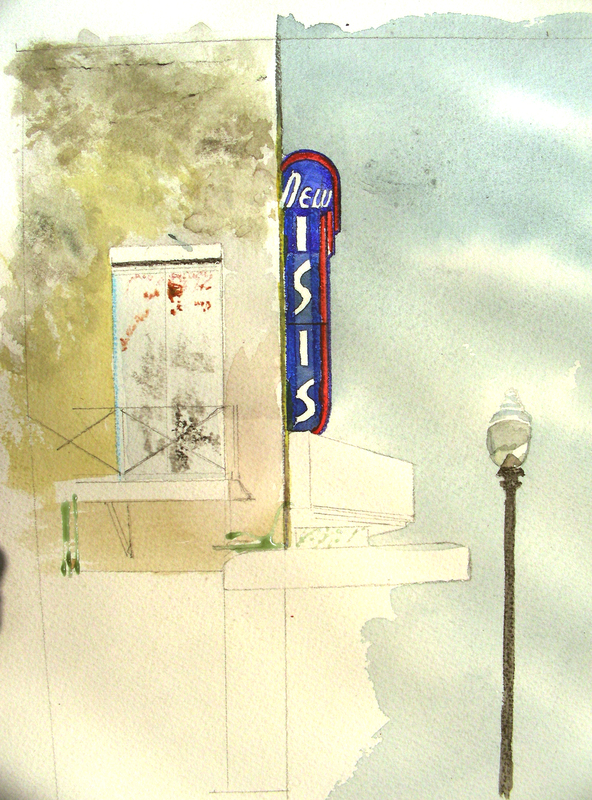 Several friends over the years have recommended that I paint the New Isis Theater in north Fort Worth. Late this afternoon, with temperatures hovering near the triple digits, I journeyed to the Fort Worth Stockyard District, and photographed the New Isis on North Main from several different angles. But the time of day was wrong, and the entire theater was in shadow and low light. So, I started shooting the commercial facades across the street as they sweltered in the setting sun. I shot a number of photos of interesting ghost signs that I just may pursue soon. But in the midst of it all, this single portal arrested my attention because of the brightness of the sun on it, the smoggy window pains, and the abuse I saw all over the surface of the door. By the time I got back home, the hour was drawing late, and I felt the fatigue of the day pulling at me (I taught summer school this morning, 7:35-12:45). I blocked out an 8 x 10″ picture plane and worked a little over an hour on this before stopping. There is much refinement waiting to be done, but I have the basic washes in place, and even managed to drybrush some of the textures. I’m looking forward to getting after the New Isis under good sun. Perhaps tomorrow. I journal because I feel alone. I keep returning to these words from Thoreau and Hemingway, wanting to sustain the energy for daily thought and visual art as they did for thought and the written word. They believed in their ideas, their abilities, their daily craft. And they pursued these with unflagging purpose. I painted yesterday, though tired. I painted again this evening, though tired. I’m still recovering from the extensive travel and workshop activity, and jumping into the daily summer school fire (English IV) as I write this. But weary as I feel tonight, I am delighted that I said Yes to painting these last two times. 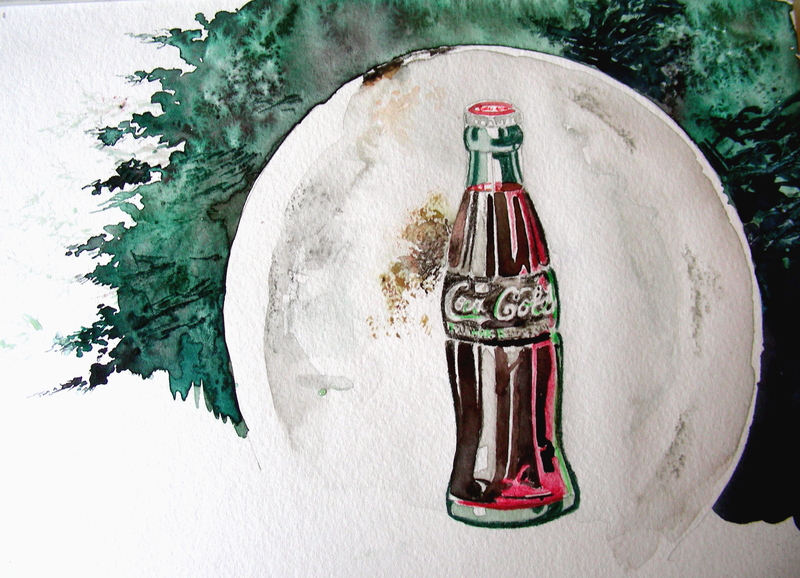 And I’m very pleased with how this small 10 x 8″ watercolor sketch is progressing of my vintage Coca-Cola sign. I’m chipping away at this sign, remembering those countless times as a child that I saw signs such as this mounted on fence posts, general stores and billboards in southeast Missouri. This sign is as genuine a relic of Americana as anything I have witnessed in these past decades. I’m proud to own it, and so pleased to have this opportunity to sketch it, paint it, plot out future compositions with it. I’ve added quite a bit since yesterday, mostly the distressed marks, rust and buckshot damage on the background of the sign, as well as the shadows running around the curved side. 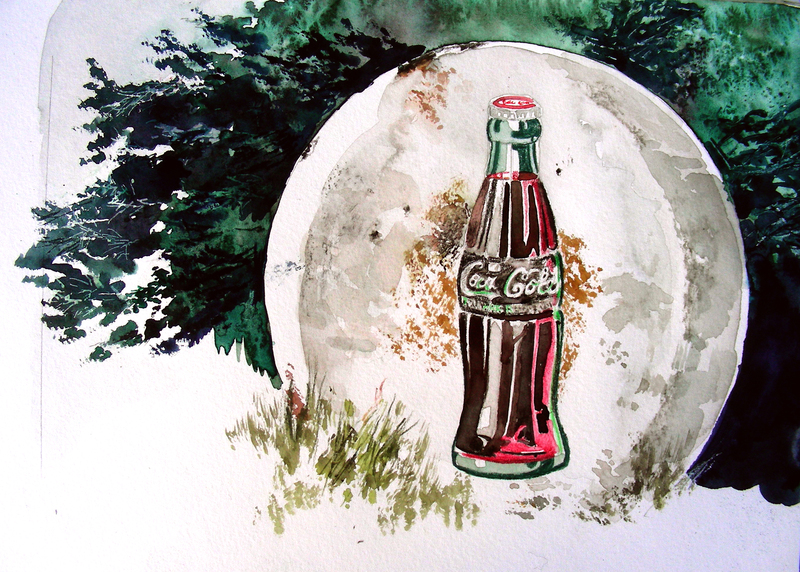 I also extended the background on the left side, darkening some of the evergreen. I have some masqued highlights in the evergreen that I’m anxious to remove, but I have soaked the composition, and it’s going to take awhile for it to dry sufficiently for me to remove the masquing. I believe I’ll finish this one tomorrow after school, and put if up for sale, 10 x 8″ with a 14″ x 11″ white mat and plastic sleeve. Asking price: $100. Thanks for reading. Talk to you tomorrow! Routine is a ground to stand on, a wall to retreat to; we cannot draw on our boots without bracing ourselves against it. It is the fence over which neighbors lean when they talk. . . . Our health requires that we should recline on it from time to time. When we are in it, the hand stands still on the face of the clock, and we grow like corn in the genial dankness and silence of the night. 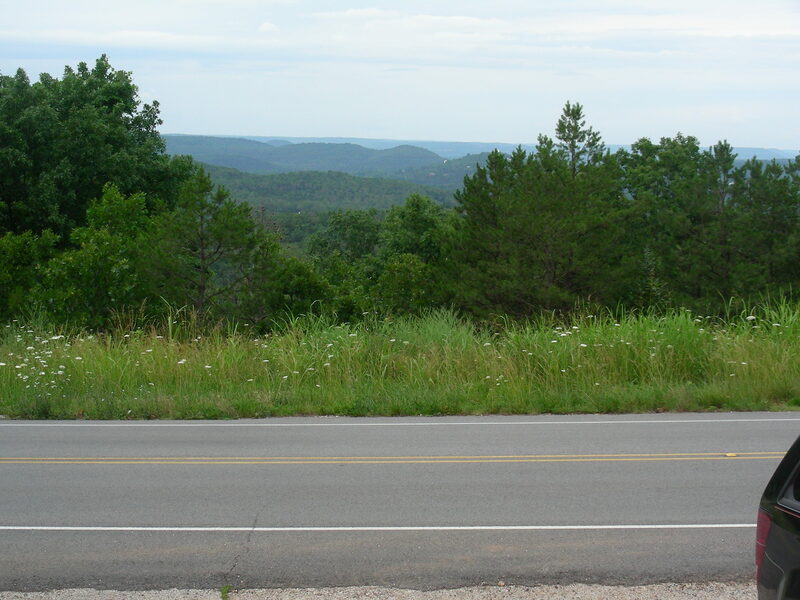 When I drove away from the Eureka Springs School of the Arts last Friday, I felt so much good will from a class that performed above and beyond expectations. I also felt satisfied in completing several demonstration watercolor sketches. I thought that I would be O.K. with extended road time and the possibility of not picking up the watercolor brush for days. But as Sunday dawned, I already felt a sense of listlessness with the broken routine, and decided to get back into something. I acquired this magnificent 36″ antique Coca-Cola sign a few weeks back, just before I hit the road to do back-to-back workshops. I never forgot about the sign, and thought it seemed silly to transport it in the back of my Jeep with all the rest of my watercolor gear and suitcase. But the sign has been on my mind, and I thought that today I would try a few rough sketches of it. I pulled out my “Fluid” watercolor block, hoping that that would signal a loose sketch and not a finished painting. What is wrong with me? Why can I not just cut loose? Oh, I worked fast on this indeed, but, as you can see, it’s not loose. It’s just as tight as though I were working on a full sheet of 300-lb. watercolor paper. It is only 10 x 8″ but I worked as tightly and accurately as I could, though I worked fast indeed. This is what I accomplished over the course of a few hours today, and I loved every minute, every second of the experience. The sign has some corrosion, and plenty of abuse from a shotgun blast that I still haven’t really put into the composition yet. And I’m still trying to solve the problem of an evergreen backdrop, spending plenty of time perusing Andrew Wyeth drybrush studies of evergreens. I am so glad to have this sign in my actual presence, rather than trying to work from a photograph. The relic is magnificent to behold. Thanks for reading. It’s nice to be back into the watercolor routine after only a two-day hiatus. Geometry is our greatest creation and we are enthralled by it. . . Man has drawn himself up like a giant, he has forged himself a tool. He no longer works with his hands. His spirit gives the order. He has delegated to the machine the work of his clumsy and unskillful hands. Freed, his spirit works freely. On square paper he dreams. Rising early this morning, I was again greeted by the beautiful, warm sunshine of Eureka Springs. Sitting on the terrace, I found fascinating ideas from a biography I’m reading on Le Corbusier. As this young architect moved dialectically between natural forms and geometry, I was inspired to approach the Harding Springs and look at the Greek column and krater sitting in all their geometric stillness in the enveloping embrace of those beautiful shrubs, backed by the looming cliff, Lover’s Leap. 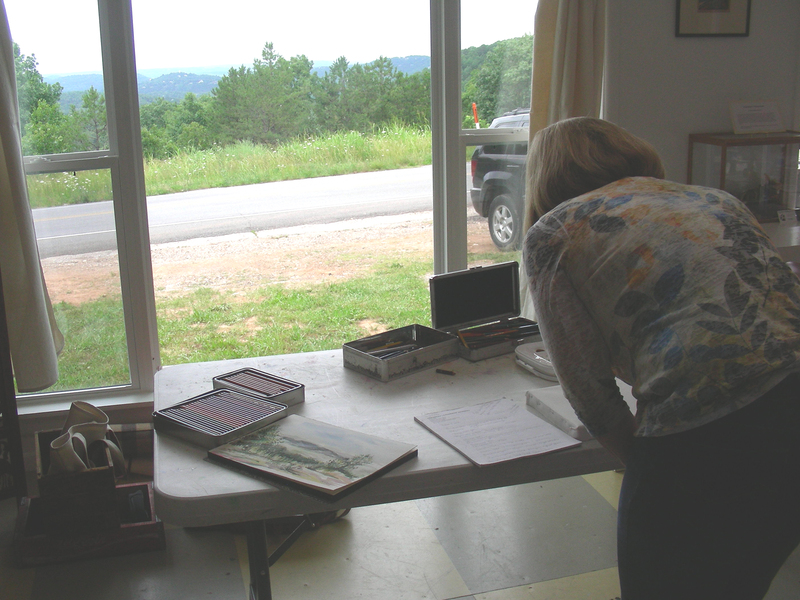 The Plein Air Workshop group arrived early and set up immediately, choosing their compositions around Harding Spring. 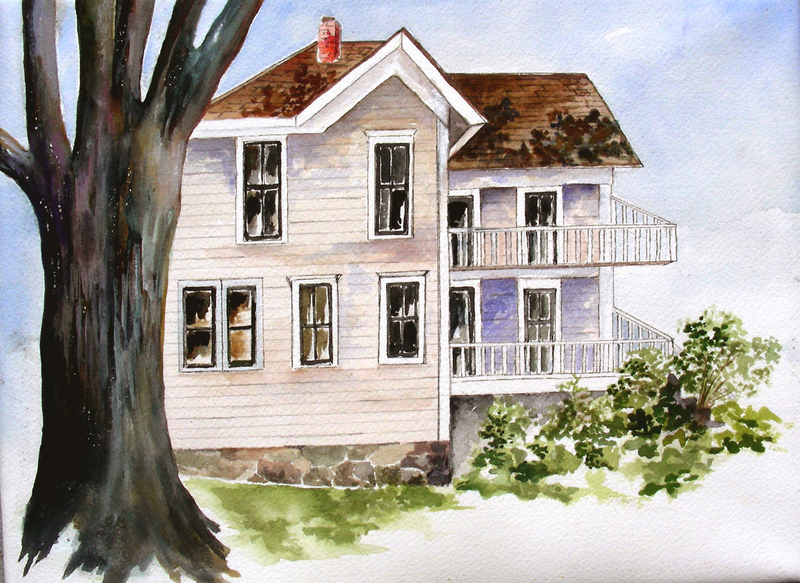 Sitting in the midst of Harding Spring, Jean peered through the landscaping and across the street at a local business. She decided to build a composition contrasting nature with architecture, flowers over against a stone building. 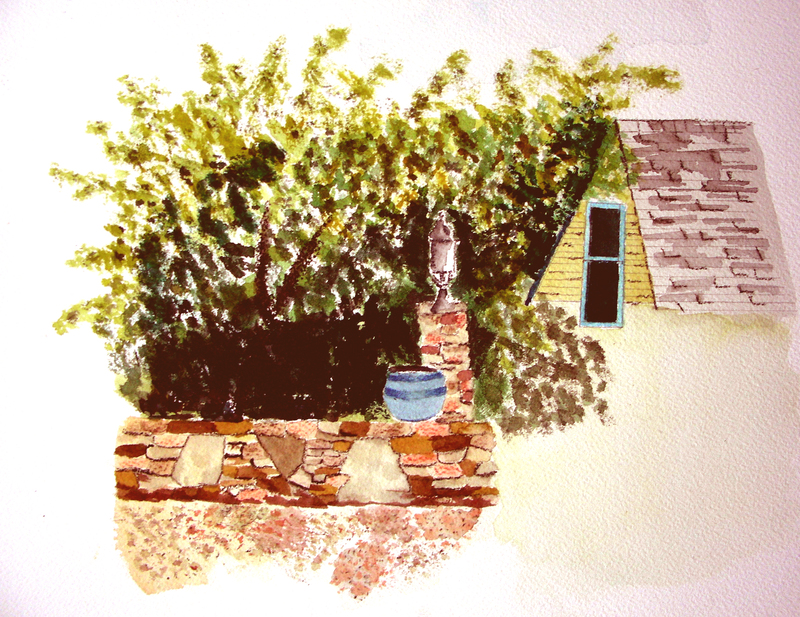 As she worked on this watercolor, she continued to build contrasting darks and lights, warm and cool colors between the building, the shadows and the flower beds. After focusing on architectural rendering for two days, Debbie today decided to work with nature exclusively, hoping to keep it loose and Impressionistic this time. 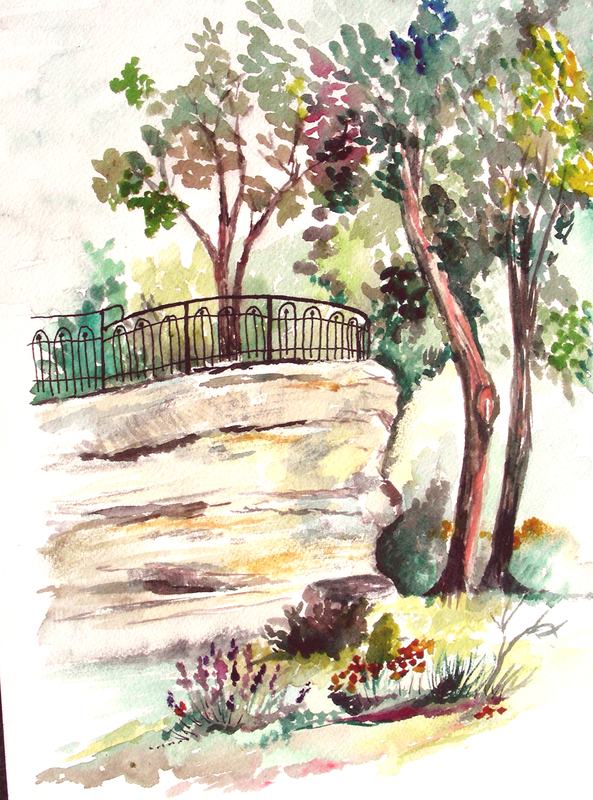 She ended up with this Cezannesque-looking watercolor of Lover’s Leap at Harding Spring. I was fascinated with her contrasts of warm and cool colors threading through the foliage and rock facade, much as Cezanne composed in his studies of Mont Sainte-Victoire. At the end, she decided to go ahead and include the man-made railing at the top of the bluff. Barbara was fascinated with the foundation stones and Greek monument along with the bluff and trees in this setting. She worked feverishly on contrasting colors, seeking ways to make the bluff, tree trunks and monument emerge from the composition to take center stage. On the rock facade, she experimented with a number of techniques until she came up with this satifsfying compositional conclusion. I have only tomorrow morning left to spend with this class, and I miss them already. Their daily enthusiasm was contagious, and I could not help catching their fever. I cannot wait to see them in the morning, knowing their daily company has changed me profoundly as an artist, affirmed me as a teacher, and given me a new sense of vision in the pursuit of the arts. My thanks goes out to all of them, and to all of you who take the time to read my daily musings. What we need is more sense of the wonder of life and less of this business of making a picture. Your painting is the marking of your progression into nature, a sensation of something you see way beyond the two pretty colors over there. Don’t stop to paint the material, but push on to give the spirit. We laughed together over lunch, saying this was “hump day” and therefore the hardest part of the five-day workshop. Then we returned to the field to prove ourselves wrong. 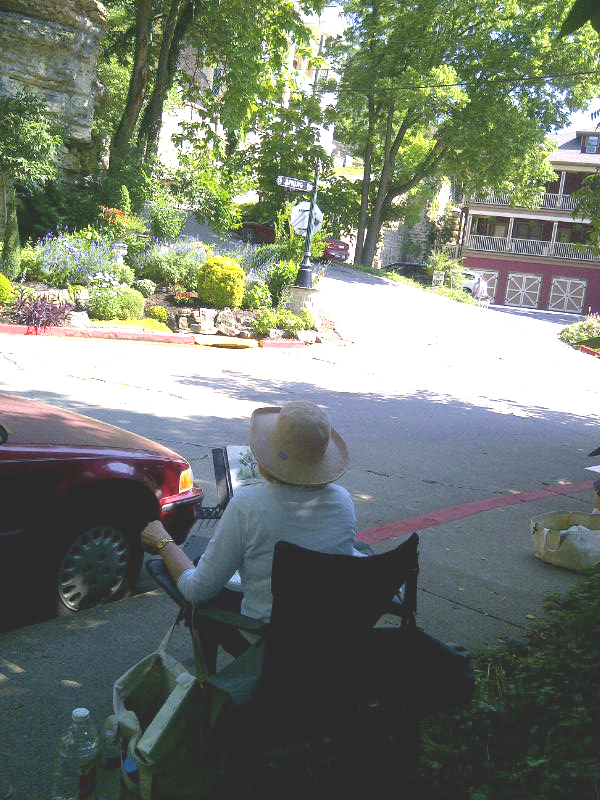 The day reached 90 degrees, and was high in humidity, but we managed to stay in the shaded areas, for the most part, and doggedly pursued the compositions we had carved out of the neighborhood on Summit Street in the upper Eureka Springs historic district. At the end of the day, we were tired, sweaty, thirsty, but satisfied that we managed to turn yet another corner in our watercolor pursuits, and learn a few more lessons in composition. Pictured above is the sketch I picked over intermittently throughout the day, of a twin-gabled bed and breakfast I found very attractive. I tried my best to stay attentive to what the workshop participants needed, and covered about a fifty-yard area to walk back-and-forth between them. 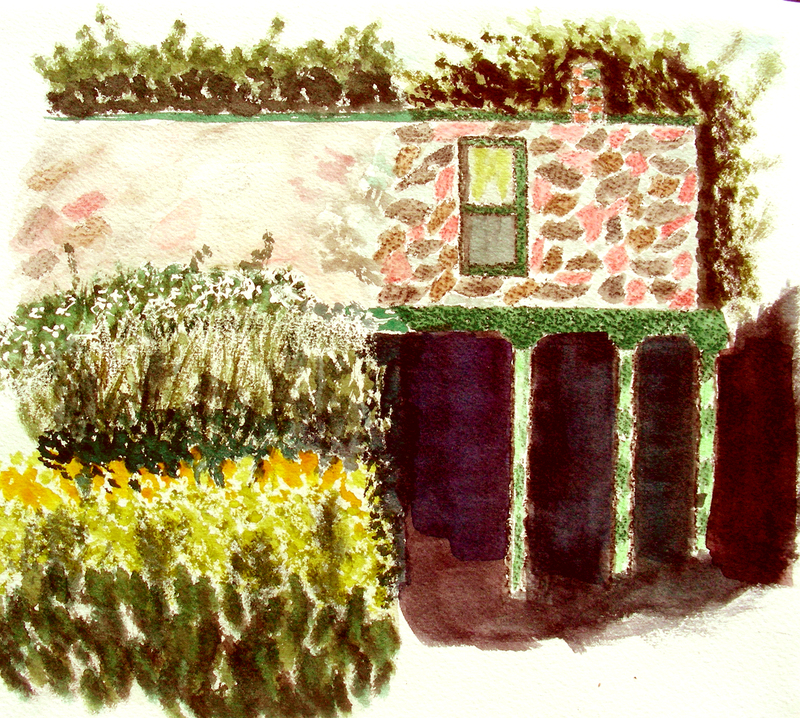 I never managed to get the yellows the way I wanted them on the gables of the house, but enjoyed working the green trim and the beautiful landscaping out front. Barbara spent a great deal of time Tuesday drawing out this composition, and had barely begun the painting of it when it was time to quit. I photographed and posted last night what she had completed up to that point. 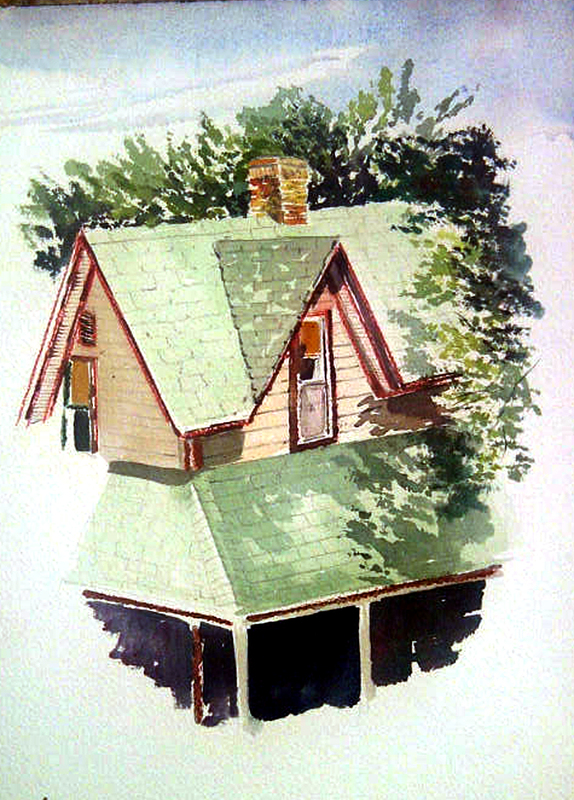 Today she returned to enrich the tree, cast shadows on the house, re-work the wooden siding of the house, and add more texturing to the roof. 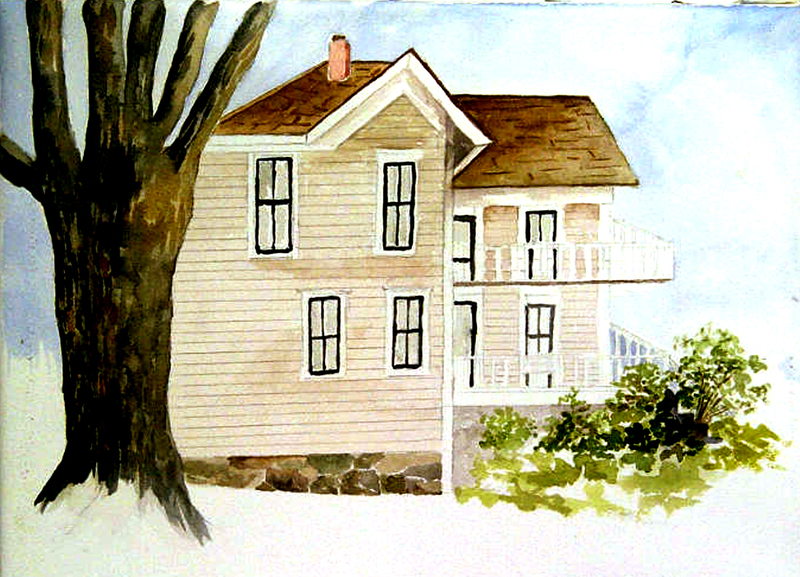 The lavender and rose hues she used to dapple the shadows on the siding have given the painting an exquisite look. With the time remaining, Barbara drew this composition in very carefully, then re-worked it in ink to keep from smearing the graphite all over the page. There was little time remaining for the actual painting, but she knows there is still tomorrow and Friday to complete it. 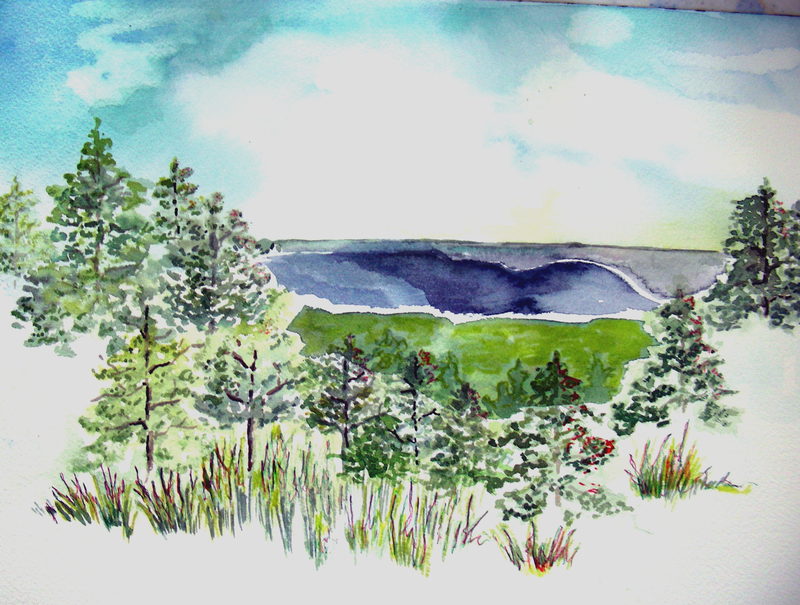 After putting some finishing details to the watercolor she created yesterday, Debbie went after this composition with a keen sense of purpose. Already in her mind’s eye, she knew what she wanted from this composition–to place this sharply detailed house against a backdrop of out-of-focus, wet-on-wet foliage. 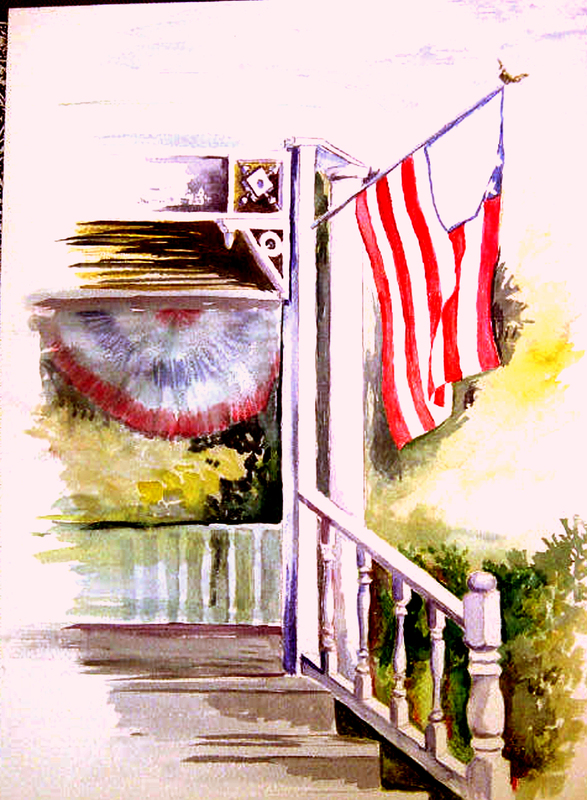 She also knew she wanted to masque the picket fence and drybrush vigorously about it, remove the masque, and then render in pencil the separation of the uprights from the horizontals. Everything worked. 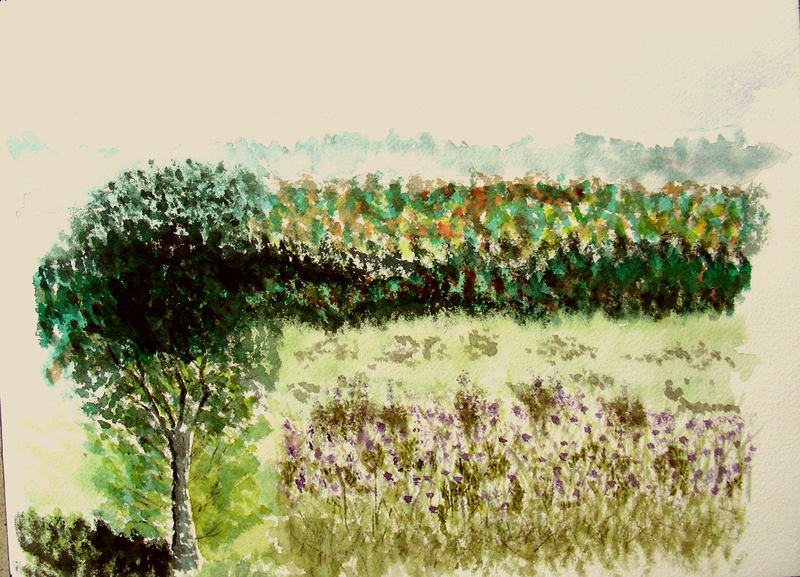 Dissatisfied with the foreground tree being too dense, she used an x-acto knife to scrape white reflective areas into the leaves to create a sense of liveliness. That also worked. Everything she set out to accomplish, she did, and managed to finish in one day. 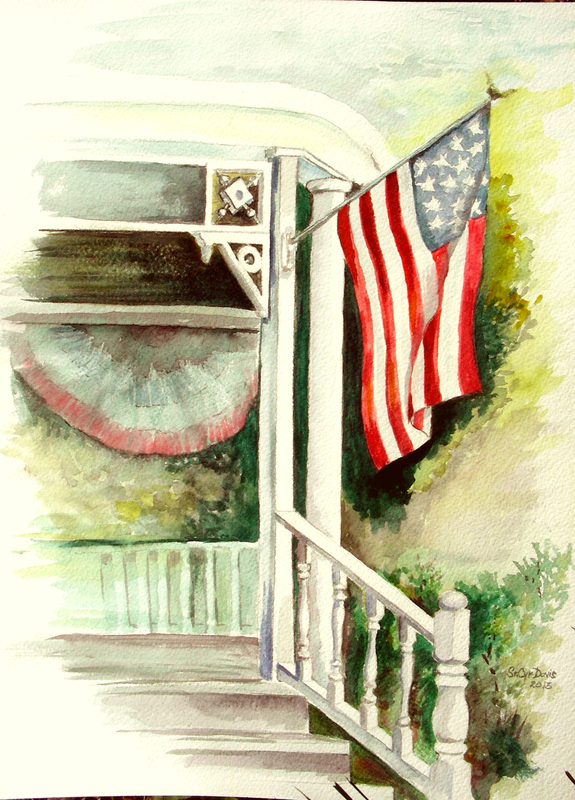 The only thing left for Debbie to complete on this composition was heightening the contrast between the flag, the pillars, and the intricate modeling near the roof. She also warmed up the upper right-hand corner of the composition with Winsor & Newton Transparent Yellow. 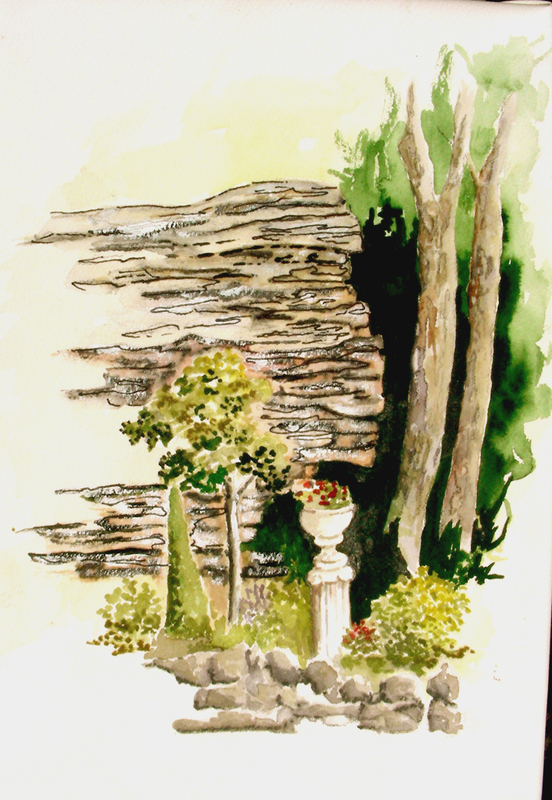 Jean was immediately attached to this stone wall and gravel lot fronting a rich backdrop of foliage. 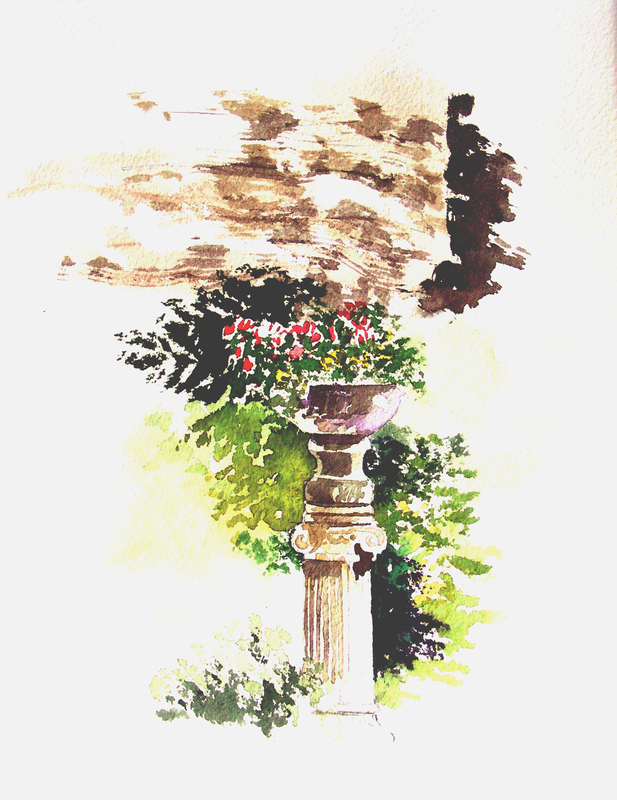 Her interest focused on the blue planter and lantern perched on the pillar. Most of her experimentation of the day was given to the texturing of the rock wall and pea gravel on the parking lot. Her final touch was the darkening of the background foliage. Everything worked for her today. I cannot say with honesty that I was happy with my own work today, but then again, I didn’t really concentrate too much on it. In between offering of guidance to the other participants’ works in progress, I took some stabs at my own plein air sketch. But my dissatisfaction with my own piece doesn’t matter. My heart overflows with joy, looking at what the class cranked out on this successful “hump day.” I believe that all of them felt a sense of accomplishment, a sense of “pushing through” the appearance of what was in front of them, and creating a legitimate painting from their own unique vision. And that makes my heart swell with joy this evening. Thanks always for reading. These are good times at Eureka Springs. People have not looked largely at life, mainly because our education drowns us in detail. I awoke long before the alarm this morning, spent about two hours, enjoying coffee, leisurely reading and thinking on this beautiful terrace at my Eureka Springs lodging, then met my class at a residence on Summit Street. We found beautiful compositions in every direction we looked. 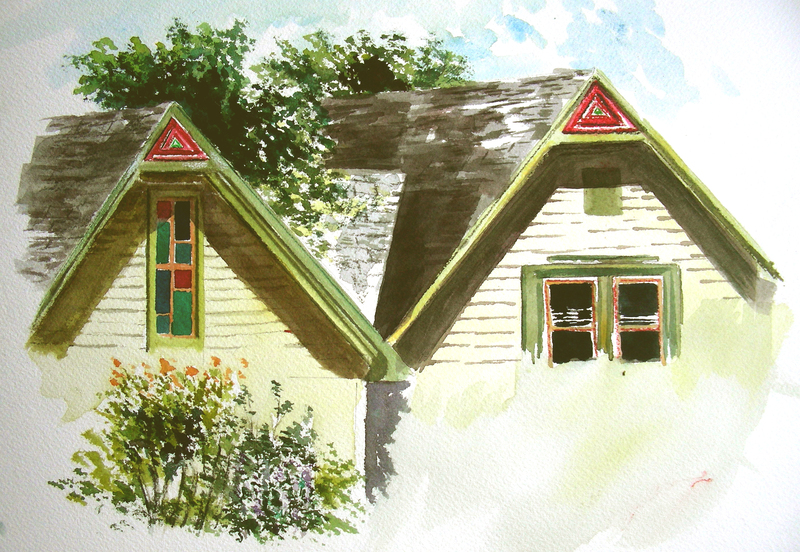 I chose a vantage point from a balcony of the residence and looked down across the street onto this lovely house, and did this quick plein air sketch in two stages–first to get the students primed to begin an architectural composition, and then second to record some accents and details. I opened this post with the Henri quote because I thought it ironic that I was in class again, having been out of school barely more than a week. But at the same time, I felt that I was not drowning these eager painters in details. Rather I was trying to incite them to paint more decisively, more confidently. 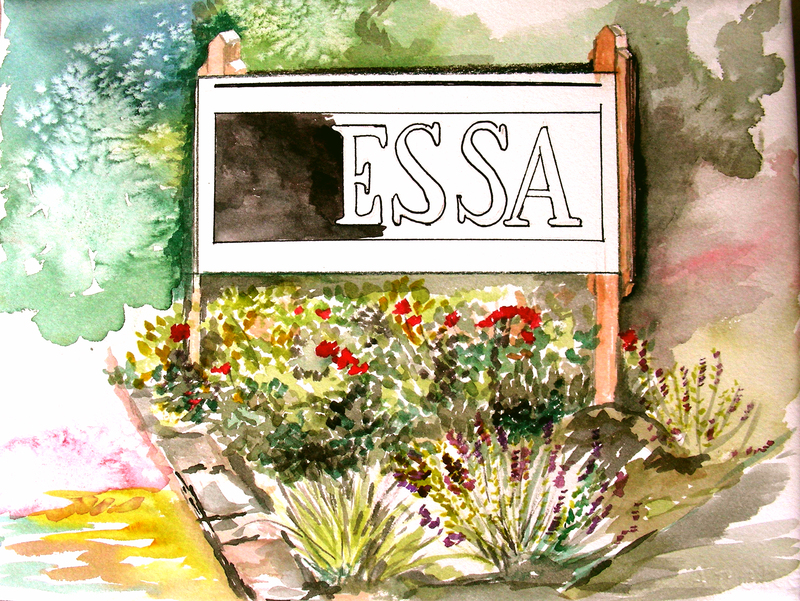 How wonderful to attend a school without walls, to paint without restrictions, to walk out into the surrounding neighborhoods and carve out compositions to capture in watercolor sketches. I feel as though I have turned back the clock a couple of decades on my life. Today was even better than yesterday, and the students have really picked me up. I cannot wait to see what they do tomorrow. Tomorrow we’ll return to the same location to finish up work begun today, and begin new work across the street where we have been welcomed to another residential site. To see far is one thing: going there is another. The first day of my Plein Air Watercolor Workshop is in the books, and I feel that I have crossed over into a new frontier. All my students thrived today in our introductory session, and frankly, I am not used to that. 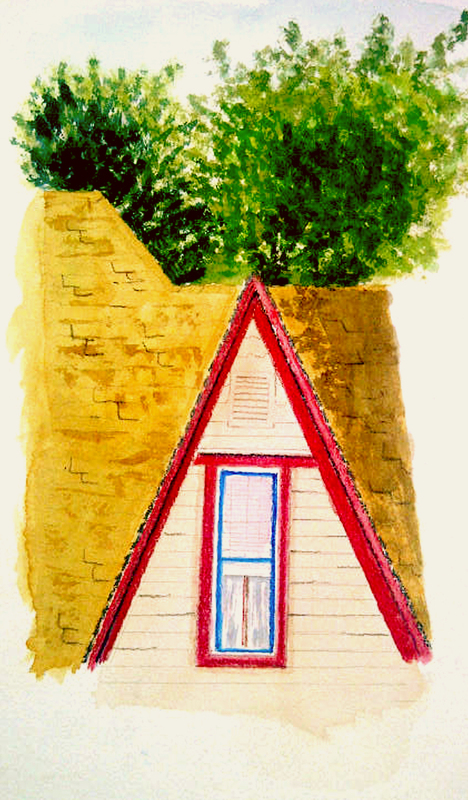 I am sitting in a daze on the back terrace of the beautiful Anderson Suites in Eureka Springs, staring across the gorge through a downpour that is cooling the trees before me, enjoying my coffee, and recalling every rich experience I knew today as I watched a very eager group of participants engage in plein air watercolor exploration. The questions were genuine, the enthusiasm was contagious, and every participant seemed to finish better than she began this morning. Below is the terrain we witnessed as we looked out the open front door and through the large studio windows of our school. 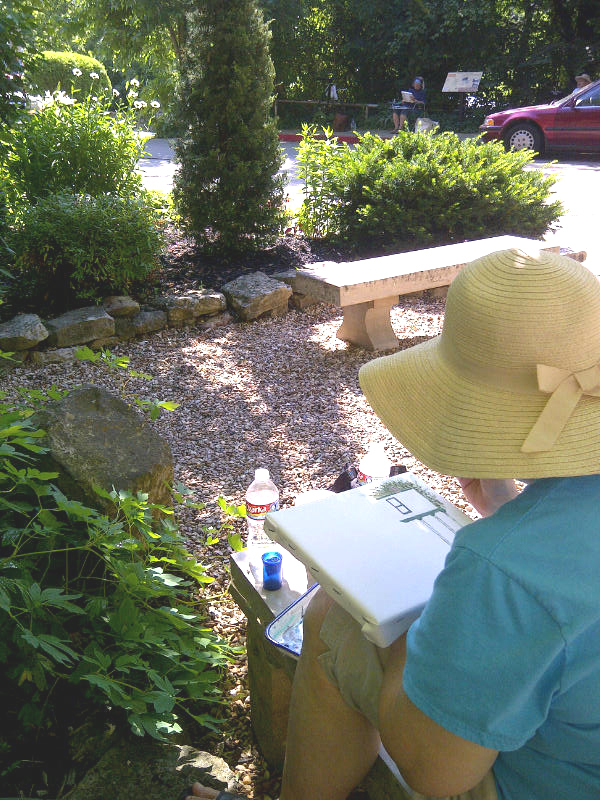 After I completed a short demonstration of watercolor techniques and tricks, the participants began to compose their initial watercolor sketches of the natural outdoors. The eager painters went after their compositions in a hurry, and the six-hour session flew by. None of the above sketches were completed before I photographed them. Tomorrow I’ll update them, and show the new work as well. We spent the entire day today at the Scool of the Arts studio. 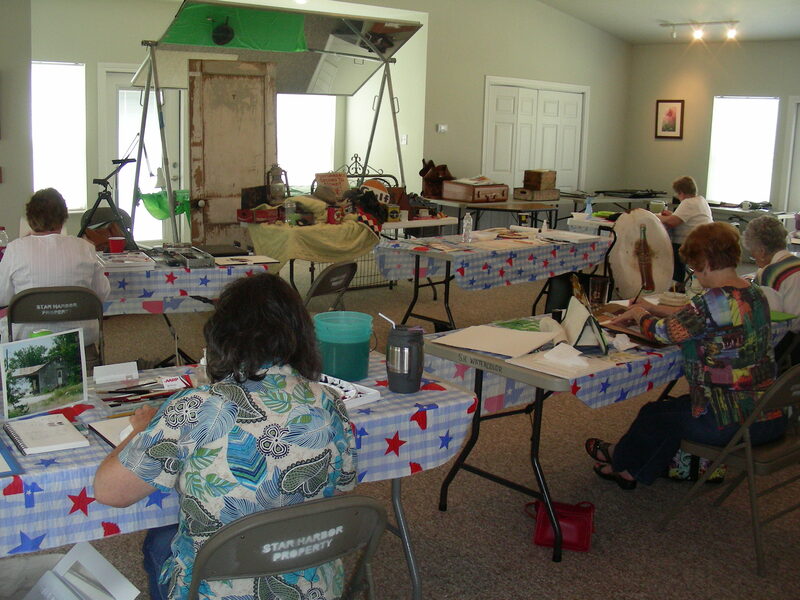 Tomorrow we will gather in historic Eureka Springs and paint the exotic subjects found on site. Brancusi nailed is when he wrote: “To see far is one thing: going there is another.” I feel that the new acquaintances I made today in the studio have helped me go further than I ever have before in the community of plein air painting. I can hardly wait to greet the morning. 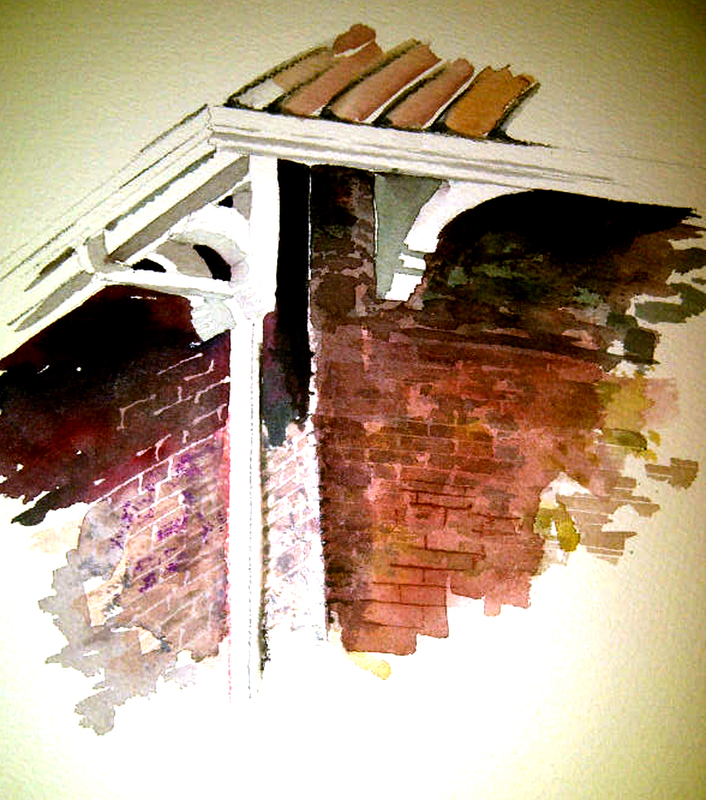 Several of the participants wanted some guidance on sketching architecture in watercolor, particularly brick facades. Thanks for reading. 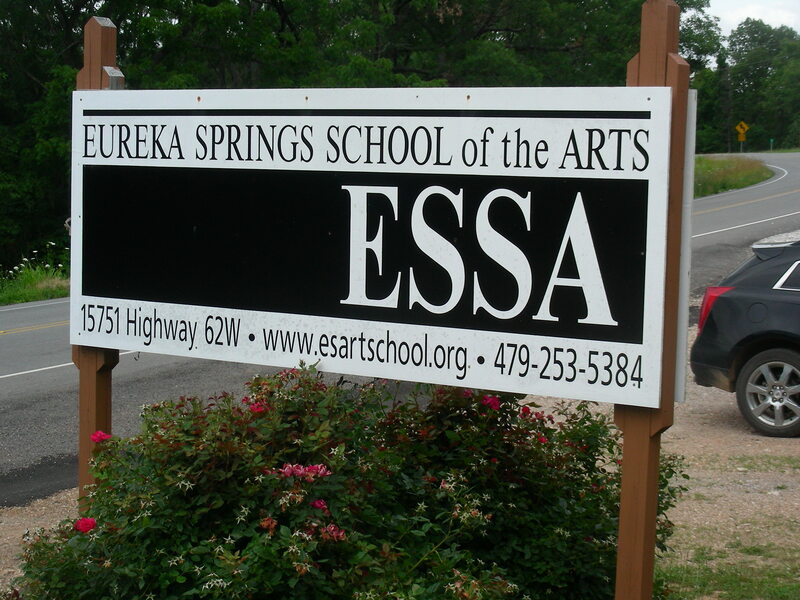 Eureka Springs School of the Arts is next. 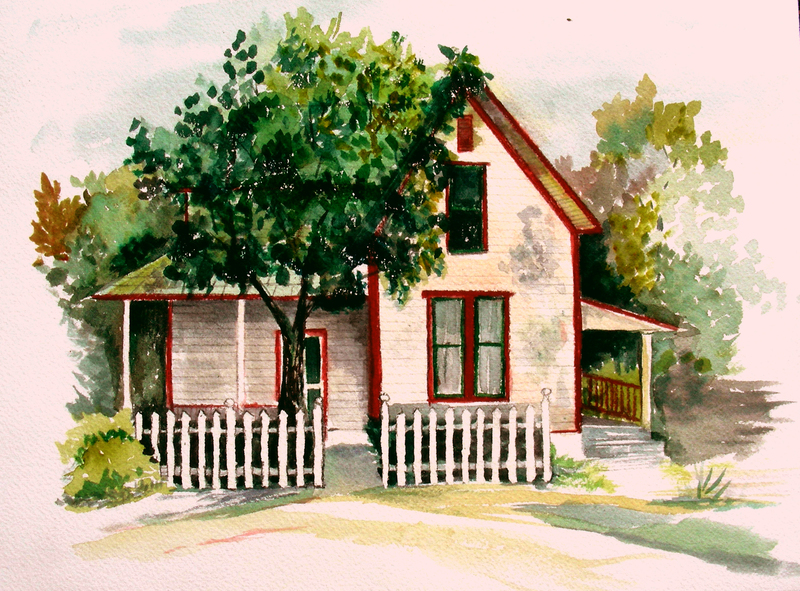 I’ll be doing a five-day watercolor plein air workshop there, my fourth year in a row. I absolutely love that Victorian mountain town and all that is has to offer to the willing painter.